Home » DMHP » Unearthing Omissions and Commissions: The bureaucratic trail of decision making for ‘Day-care’ centers for the mentally ill.
Unearthing Omissions and Commissions: The bureaucratic trail of decision making for ‘Day-care’ centers for the mentally ill.
Tracing the bureaucratic trail of the  'Comprehensive mental health program (New Scheme-2013)' of Kerala:  A documentary search using RTI inquiry. Finance Minister K.M. Mani earmarked Rs.20 crore for a new ‘comprehensive mental health programme’ to be executed by NGOs and schools. A news-report on March, 2013 thus introduces the ‘comprehensive mental health program’ to the larger public. It has a comment by a key functionary of the professional community of psychiatric doctors of the state. The Kerala-state budget document of 2013 (available at http://finance.kerala.gov.in/) echoes what the minister reported to the press. (see relevant excerpt: page 356 below with highlights added).The source of the fund is designated as ACA (Additional Central Assistance), which means this money is provided by the central government directly to the state budget. The Special working group meeting convened by the additional chief secretary-Finance for the consideration of administrative sanction (See minutes of meeting here and relevant excerpt below) also instructs certain particulars about how this program should be implemented as highlighted in red underlining (see below). Now let us fast-forward one year to March, 2014 and see this news report which announces the actual roll out of the ‘Day Care Centers’ for the recovered mentally ill in the state. One fact that can capture the discerning eye, when we look at all of the above documents in sequence, is that, as the program moves down the implementation pathway, certain aspects get edited out.The multi-disciplinary involvement with the social justice dept or the education dept or the NGOs which were envisioned in the earlier stages, vanishes when it reaches the final news-report on its actual roll out. How does this happen? Is it due to acts of omission or commission? Specifically at what places in the implementation pathway does this occur? What could be the reasons for it? Let us briefly explore. I try to explicate specifically, the bureaucratic trans-active processes at the decision making level. The relevant textual documents which gets generated in the administrative ‘due-process’ are analysed to throw light on the processes. We shall proceed by asking certain empirical questions as below. What model of working for the ‘Day care Centres” have the state level planners envisioned under the ‘comprehensive mental health program’? Was it evidence based? Were there other models which also came for competitive consideration? Click to see the three page plan proposed for the Day-Care centers by the Director of Health Services contained in the administrative sanction letter issued by the Health Secretary. As can be seen, it is an over-the-top operational plan which the Health Department submitted for approval. Interestingly in each day care center (2 each for all 14 districts are sanctioned) Rs 4.69 lakhs was set aside for buying 30 “Iron cots”, mattress, pillow cover, and bed sheet! This is patently unscientific (act of commission no 1) and reveals a certain institutional character in thinking, quite unhelpful for planning community based services.Ironically the plan recommends recruiting contract nurses who are retired from mental health centers or have experience in psychiatric hospitals!! The structure of the plan clearly reflect that the stakeholder consultations were not made. This was specifically asked in an RTI query to the health directorate which gave the reply that consultative meeting involving the social and educational sector or the NGOs were “not convened” and “committee was not formed” and the people involved in formulating the plan for the daycare centers were only “Experts from the health department were psychiatrists from medical college and mental health center and mental health authority” (act of omission no 1). The minutes of the meeting by the finance secretary which considered the proposal for administrative sanction from the health dept (identified in the document as ‘administrative department forwarding the proposal’) clearly identifies the ‘implementation agency/department’ for the program as “committee with experts (as stipulated in plan write up)”. This ‘plan write up’ is probably what the health dept would have submitted as part of proposal generation before the budget.Though we do not have direct access to this plan write up, the snap shot of page 356 from the final budget document provided in this blog is representative of that. Progress assessment of the functioning of the daycare centers which stated working. Needless to say, the roll out of the program ran into implementation difficulties. The staff recruited did not know what to do, many patients dropped out, sustainable need for the services in the community could not be generated etc etc. However in an appraisal done by the department by March 2015, it is reported that 22 daycare centers have started working and the remaining 6 are in the process of getting started.The shortcomings in the effectiveness of the centers were swept under the carpet as quoted below (page 2 of report) and further implementation responsibility was quietly transferred to the NRHM! A part of the money was diverted for procurement of medicines also. With respect to this particular program, insider sources inform that adopting a model of using the money to financially support an NGO-run/ social-department-run ‘day care’ center was not to the liking of the medical professionals within the health department as they viewed it as fund diversion to outside agencies. An unscientific and cost-ineffective plan for running day-care centers was thrust upon the public mental health space of the state. Surprisingly and unfortunately none of the nodal offices of the DMHP/CMHP asked for a course correction in the plan and mechanically implemented a defunct plan. Reason for this lapse could be that the plan was make by hospital-based psychiatric clinicians who did not have a clear community mental health or public mental health orientation. Stakeholder participation which could have cleared this lacunae however was deliberately not sought. Deliberate ‘nodalofficization’ of the implementation machinery for community mental health in the state helps only to maintain a ‘business as usual’ attitude among the downstream implementing agents, precluding any constructive criticism/creative-engagement with plans and proposals thrust upon them. Even though alternate models for running the 'Day-Care' centers were offered/available to the planners, they chose to ignore them for a less valid model. It indicates a certain legacy model of ‘command and control’ style of functioning in a non-consultative, over-the-top fashion, which is quite unbecoming of the modern practices of planning for community-based mental health services.Certainly this is not evidence based practice. As part of a downstream course correction, the directorate may have tried to exonerate itself by thrusting on its subordinates, things which it itself could not do or should have done. Instructions to involve stakeholders in the fag end of an implementation cycle will be unlikely to be beneficial. In conclusion, this case example of poor implementation fidelity of a program even at its operational planning level indicates that a lot needs to change in our planners when dealing with community mental health services. This will include change in attitude, developing evidence based thinking, a consultative mindset, facilitating inclusive planning etc etc. It may be argued that certain system level impediments like the administrative, social and cultural distance between sectors are the actual reasons for this outcome, in which case we will have to appreciate that a mere declaration of intent for multisectoral involvement in policy and plan documents can only serve the purpose of rhetoric. Innovative models of planning and financing that can bring about joint ownership and stewardship of programs will then have to be devised for addressing this implementation gap. The initial news-report (March, 2013) which proclaimed the new scheme also contained a pertinent comment by Mr. Litto Palathinkal, president of ‘Kanivu,’ a collective of mental health rehabilitation and care homes. He said there is need for a “clear policy statement for the mental health sector ….with visions for both treatment and rehabilitation”. One major reason for the current mess was the lack of coordination among the four departments— Health, Police, Social Welfare and Local Self-Government, the report added! Added on 20.05.2015 :Blog Impact! 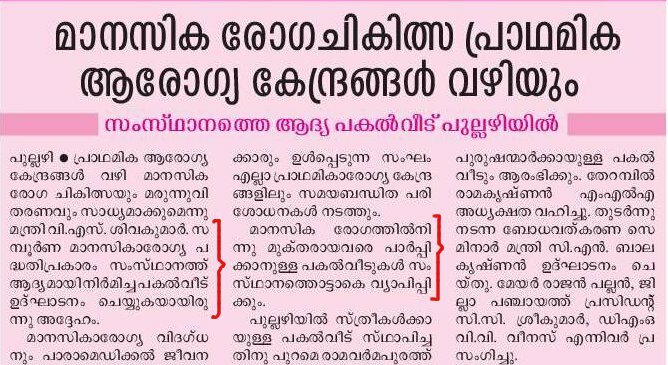 News report in asianet news channel (see video below) and paper report in Janayugam newspaper. (added on august 10) Times of India (PDF) features blog information in their article on rehabilitative aspects for mental illness and policy paralysis thereof. By kumarRam in DMHP, Mental Health Policy, Services & Policy on May 1, 2015 .